Fishermen's Community Hospital in Marathon was destroyed by Hurricane Irma. Baptist Health has been operating a field hospital in the parking lot since the storm. 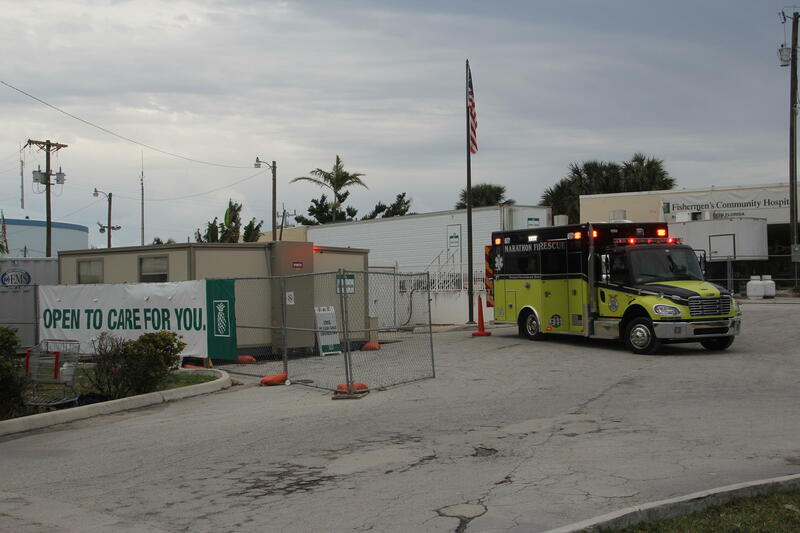 Baptist Health South Florida had just taken over Fishermen’s Hospital two months before Hurricane Irma destroyed the building in Marathon. Baptist is losing $1 million a month operating Fishermen’s in tents and containers in the parking lot of the old facility, Fishermen's CEO Rick Freeburg told the Monroe County Commission Wednesday. Freeburg was seeking the county’s help setting up a special taxing district from the Seven Mile Bridge through Conch Key (mile markers 40-63) to help pay for operations while Baptist installs a more advanced modular hospital — and eventually builds a $40 million new facility for Fishermen’s. The proposed tax would be $50 for every $100,000 of taxable value. So the owner of a home assessed at $300,000 would pay $150. Estimates are it would raise about $1.5 million a year. Marathon Mayor Michelle Coldiron said the city supports the idea to help maintain access to critical care nearby. “We have boating accidents. You could fall off a roof, you could have a heart attack. You could be a little child and have an asthma attack,” she said. Without a critical care facility, residents and visitors in the Middle Keys are facing a 40-50 mile drive — or an expensive airlift — for help. She said having a local hospital is important for a community. County commissioners supported the move but can’t approve a special taxing district until next month. If the commission creates the taxing district, it would have to be renewed annually. Commissioners also suggested putting a referendum question on the August primary ballot. Voters in the district could approve the special taxing district for up to 10 years.